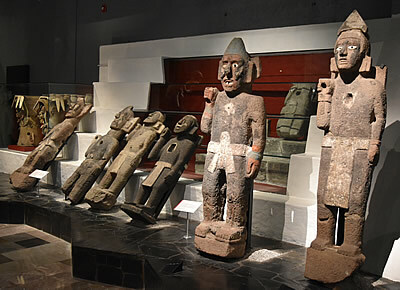 The ruins of the Aztec capital, Tenochtitlan, are fascinating; intriguing sculpture and painted reliefs and the many fabulous artefacts in the museums help in understanding the Aztec life and beliefs. 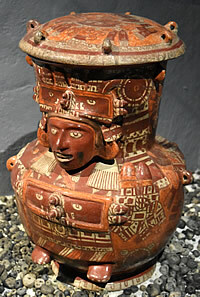 Polychrome ceramic jar with image of Chicomecoatl, the maize god. Studying the development of civilisation in the Valley of Mexico, where Mexico CIty is situated, I have relied heavily upon "Mexico: From the Olmecs to the Aztecs"1 by Michael Coe and Rex Koontz. I can highly recommend it for anyone with more than a passing interest in what led to the development of great cities in the region, and the lives of the people, in terms of agriculture, warfare, religion, art and social structure. The volcanic valley was once almost totally covered by a vast shallow lake. Ten thousand years ago hunter-gatherers would have roamed through the land, the first villages appearing around 1800 B.C. The swampy margins of the lake would be ideal for raising food - squash, maize, beans and chilli peppers being the all-important crops. Pottery and carved figurines have been discovered in even these earliest settlements. 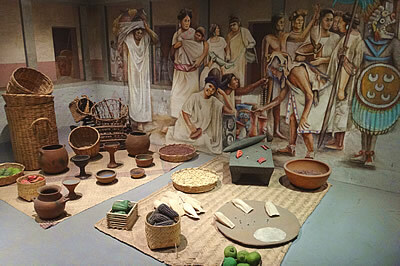 Display in the Museo Templo Mayor showing typical baskets, pottery and produce; a market scene with a masked guard, the people wearing simple robes and tunics. 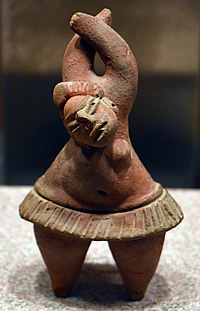 Tlatilco, on the western shore of the great lake, was the key site of the Early Preclassic (roughly 1800 to 1200BC) in the Valley of Mexico.1 Graves in the settlement have yielded a very wide variety of figurines from men, women and children to acrobats and ball players. Agricultural tools etc. 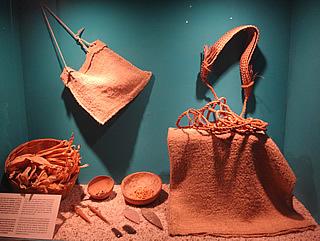 included gourds used to carry or hold e.g. water or food; bags made from vegetable fibre held seeds during sowing, among other uses; blades made from stone to cut weeds, crops, etc. - obsidian blades may also have been used but this was a very precious material. The little girl is dressed exactly the same as her mother. 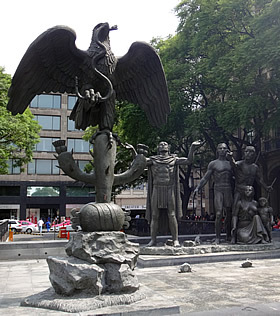 The legend of the founding of Tenochtitlan. Using a metate to make tortillas. Traditionally the metate was used to grind grain. 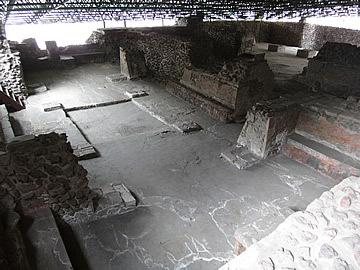 Larger groups built ceremonial or communal buildings within the village compound, eventually producing vast cities such as Teotihuacan, Xochicalco, Tula and Tenochtitlan. The site that became Mexico City developed much along these lines, though at a slower pace than the rest of the country, perhaps because the ground was so fertile there was no real incentive to push development. The Mexica, who we know as the Aztecs, were a north Mexican people. Early in the twelfth century they travelled south in search of a new home, guided by their tribal deity Huitzilopochtli,1 until they reached the great lake. Here they saw an eagle perched on a cactus with a snake in its beak - the sign that Huitzilopochtli had told the Mexica would indicate that they had reached their new home. Many people were already settled here, and the newcomers were regarded with suspicion, but allowed to live an almost slave-like existence working the land for their masters. However, making a sacrifice of a princess given to their chief as a bride was not a good move (they apparently hoped she would become a war goddess) and the Aztecs were banished. Made from pine but now almost completely petrified. 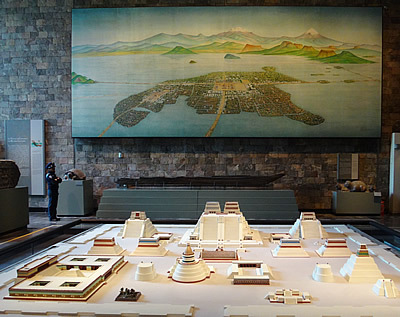 The ceremonial centre at Tenochtitlan before the conquest. On the wall a picture of how the city might have looked, on the great lake connected by causeways to the shores. They remained on the marshy edges of the lake living a very poor life. By the mid-fourteenth century the Aztecs had become mercenary soldiers to the mighty Tepanecs and one after another tribal nations were defeated and brought under the sway of the Tepanecs. The Aztecs became increasingly powerful in their city of Tenochtitlan on the southern reaches of the lake, eventually defeating the Tepanecs to establish themselves as the dominant group. Thereafter a programme of expansion saw the Aztec empire stretching right to the Guatemalan border. 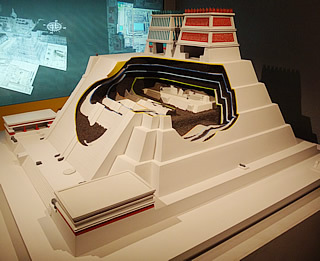 Model of successive building stages of Templo Mayor. 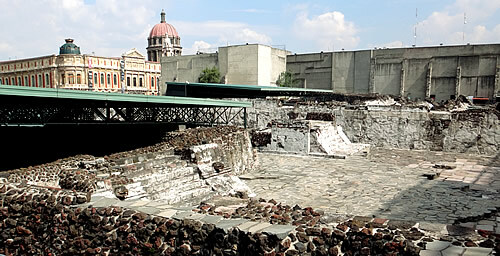 The great temple, Templo Mayor, is all that we can see today of the great city of Tenochtitlan, but it is a fascinating remnant. Like many sacred buildings throughout central America, several incarnations of the temple were created over time, partly due to settling of the swampy land necessitating a consolidation, stabilisation and rebuilding, but also to glorify the ever more powerful Aztec culture. Seven times the temple was covered in rock and mud and a new temple built, completely surrounding and covering the old; an additional five times the main facade was expanded. This level tilts forward. Little remains of the Huitzilpochtli shrine on the right, a little more of the Tlaloc shrine on the left. Templo Mayor faces west and has two shrines on the top: the north to Tlaloc, the rain god, and the south to Huitzilpochtli, warrior god of the sun and patron god of the Aztecs. The first incarnation of the temple was probably begun not long after the founding of the city but would necessarily have been quite a simple affair, though probably already incorporating the twin shrines. 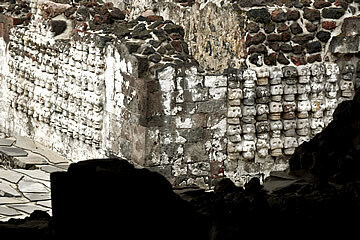 Tlaloc shrine, Stage II Templo Mayor. 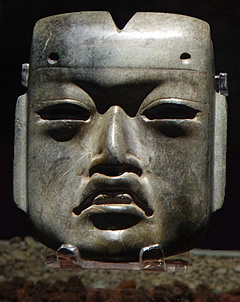 Within the tunnel on the steps, the head of a chac mool was found, the oldest Mexica piece found at Templo Mayor, dated to approximately 1350 A.D. 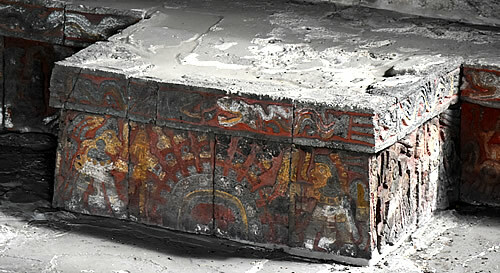 Painted stucco shrine of Tlaloc, Templo Mayor Stage II. 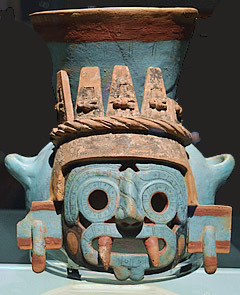 Tlaloc appears everywhere, recognisable by goggle eyes and fangs. Stage II was built around 1400, and all that has been uncovered are the pyramid platform with remnants of the two shrines on top. 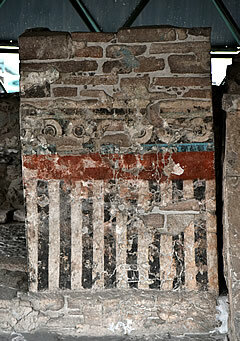 The explanation board at the site describes these as "... small, free-standing constructions, made of stone covered with stucco and decorated with mural painting. According to ancient documents, the upper part of each one of these shrines was very tall and decorated with large architectural ornaments along the roofline." 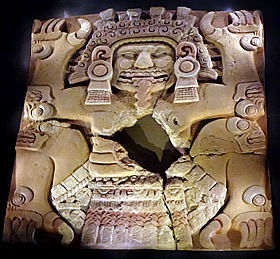 As supreme rain god Tlaloc was important throughout mesoamerica, equivalent to the Mayan Chaac. As bringer of rain he was also a god of fertility, but could wreak havoc by creating storms. Another god who needed much appeasement! 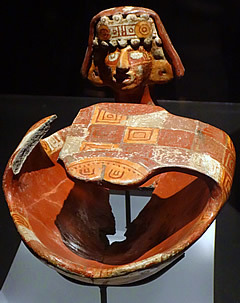 Fragments of a polychrome Tlaloc Brazier. 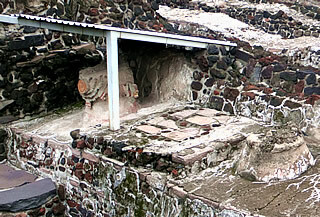 The position of the hands is typical Teotihuacan style. The Aztecs were in awe of Teotihuacan, though the site had been abandoned centuries before the Aztecs arrived in the region its magnificence led them to believe it was the birthplace of the gods. There is actually not much to see of the Huitzilpochtli shrine. 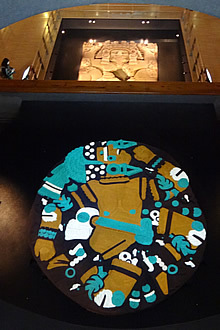 The Tlaloc shrine is slightly better preserved, with painted stucco and a chac mool in front. 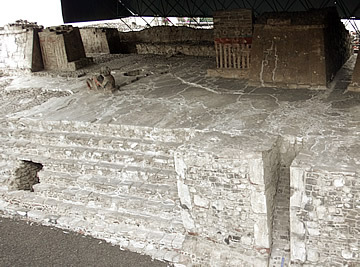 Chac mool, shrine of Tlaloc, Templo Mayor Stage II. The bowl may have been used to hold sacrificial offerings such as food, incense or even a still-beating heart. Itzcoatl, the fourth Mexica ruler, enlarged the temple on all sides. The two sets of stairs leading to the two shrines can clearly be seen. 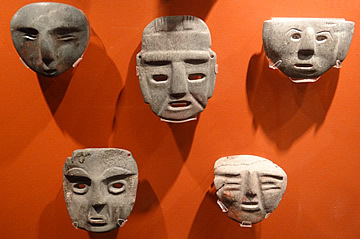 Eight statues (originals in the museum) were found at the base of the stairs leading to the Huitzilpochtli shrine; they have been interpreted as representing the sons of Coyolxauhqui due to lunar nose ornamentation that some of them wear. They are thought to have been placed here as an offering when work on Stage IV began in 1454. 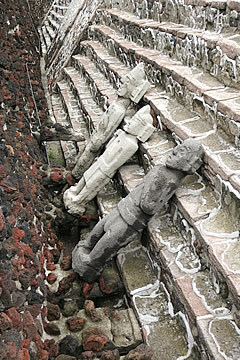 Statues found at the base of the Stage III stairs leading to the Huitzilpochtli shrine. Two have their arms crossed, six are of the type known as "standard bearer" having one closed fist forming an opening which may have held a flagpole. These also have a cavity in the chest which probably held a piece of jade symbolising the heart. It is possible that they were originally temple guardians of Stage III. The legend of the birth of Huitzilpochtli is fitting for a god of war. 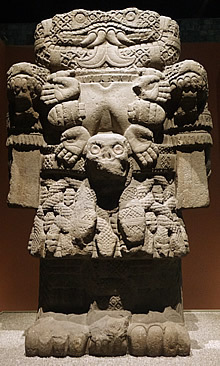 His mother was Coatlicue ("She who wears a Serpent Skirt"), also mother of Coyolxauhqui (a lunar goddess) and 400 sons representing the stars. Light projected onto the stone shows it as it would have looked, the original colours discovered from traces of pigments. Widowed, but hoping for another child, she magically became pregnant, either from placing close to her body a ball of feathers or a bundle of flowers. Her children were incensed, believing she had made up the story and had dishonoured the family, and determined to kill her. The unborn child, Huitzilpochtli, reassured his mother that he would protect her. The earth goddess, symbolic of creation and destruction, as the earth gives birth and ultimately consumes everything. The duality of her nature is expressed in the opposing snake heads which form her head. 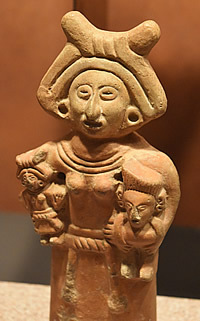 Thus her breasts are flaccid, from much suckling of babies, while around her neck are hands, hearts and a skull. The reverse of the Coatlicue statue. Coyolxauhqui stone and behind, the Tlaltecuhtli stone. Coatlicue was chased to the top of Coatepec (Serpent Mountain) where she was trapped, but here Huitzilpochtli was born as a full grown man with weapons. He hurled his sister from the summit then pursued and defeated the brothers. Thus the sun conquered the moon and the stars. 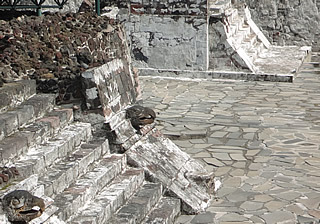 Serpent heads are much in evidence at the base of Templo Mayor, emphasising its representation as Coatepec - Serpent Mountain - on the southern side. There are also a number of magnificent large polychrome basalt serpent heads (upper left in photograph) on the west of the temple and two undulating serpents. In 1978 municipal workers uncovered a large carved stone disk showing the broken torso of Coyolxauhqui. Knowing the legend, coupled with the belief that the great Aztec temple was in the vicinity, stimulated archaeological investigations of the ancient city. 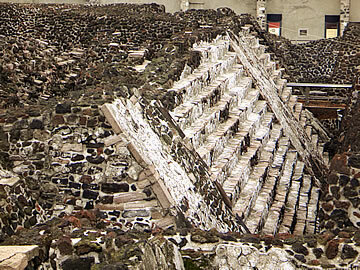 The stone, now in the attached museum, was placed at the foot of the pyramid stairs leading to the Huitzilpochtli shrine, the southern pyramid of the pair forming Templo Mayor. This side of the great temple was known as "Coatepec" by the Aztecs, which fits with the legend. 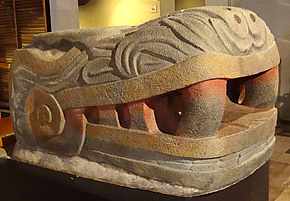 The Coyolxauhqui stone is thought to date from the end of the 15th century which would place it in Stage VI during the reign of Azuitzotl. 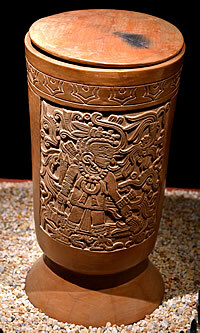 Funerary urn with relief of Tezcatlipoca. Two funerary urns were found in offerings associated with the Coyolxauhqui stone. 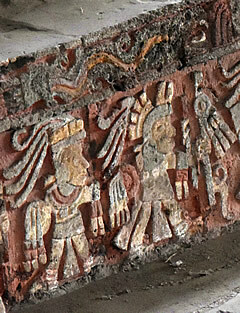 Both bear fine reliefs, though only one has been identified, as the god Tezcatlipoca, the protector of warriors. It is supposed that the cremated bones inside must have belonged to Aztec warriors. The style of the urns imitates the thin orange ceramic of the Gulf of Mexico coastal region. Sacrificial knife placed vertically in offerings. Beneath the famous Coyolxauhqui stone this more primitive version was discovered, probably dating to 1454 (Stage IV) according to an inscription on the platform. 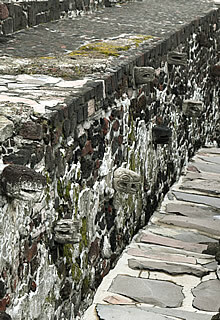 In situ at Templo Mayor, Tenochtitlan. 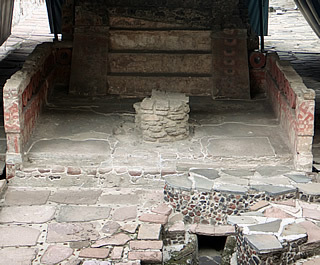 The remains of two braziers on the northern perimeter of the dual temple. Braziers blazed with fire during religious ceremonies and sacrifices. It was believed that every incarnation of the temple must have had an associated Coyolxauhqui stone, and indeed, beneath this one another was found, a more primitive version but recognisably the broken body of Coyolxauhqui. Dated to 1454 this would have been during the reign of Moctezuma I (1440-1469) when Stage IV of the temple was built.. 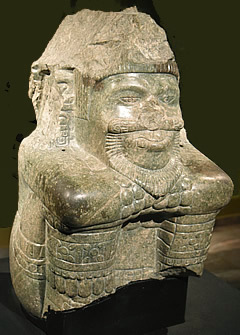 In 2006 a further monumental sculpture of a female goddess was found, to the west of the location of the Coyolxauhqui stone. Measuring some 3m by 4m this fearsome relief is of Tlaltecuhtli, also an earth goddess and goddess of childbirth, she needed to be appeased with sacrificial human hearts to ensure the continued fertility of the earth. 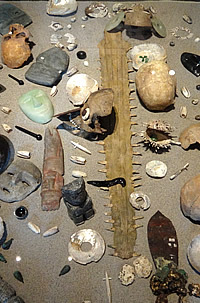 Offering including mother of pearl, fine masks and a saw from a sawfish, representing the earth monster which floats on the primordial sea. 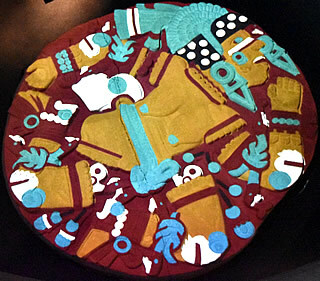 The Tlaltecuhtli stone retained a lot of colour as it had been buried beneath a plaza pavement. 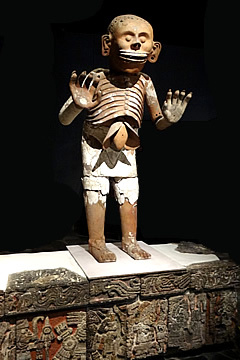 The figure has curly hair - a sign of ugliness to the Aztecs - clawed hands and feet and a river of blood pours from the abdominal area into the mouth. She is in a squatting pose which may signify childbirth. Found in offerings at Templo Mayor these masks were made from the front half of a human skull with discs of shell and pyrite to simulate eyes. The holes in the head may have been used to insert representations of curly hair to emulate the supposed appearance of underworld gods. 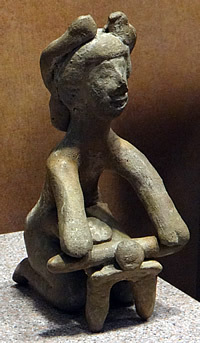 Representations of percussive instruments in stone and ceramic were placed in offerings. These include a chicahuatzli - a baton with rattles, and an omichicahuatzli - a carved bone which was scraped to give a scratching noise. Instruments were also made from human bones! 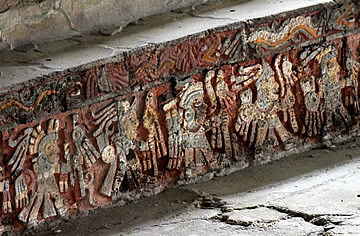 West again from the Tlaltecuhtli stone were found around 15,000 offerings buried towards the end of the fifteenth century during the reign of Azuitzotl (1486-1502), whom it is thought commissioned the Tlaltecuhtli carving. They include many items from the Pacific coast which serve to emphasise the reach of his empire and military prowess. 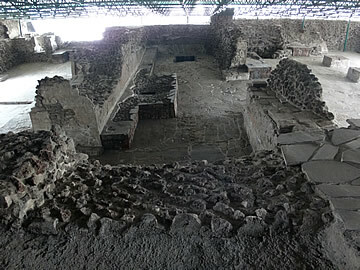 Azuitzotli was perhaps the greatest of the Aztec kings; during his reign Templo Mayor was in Stage VI. 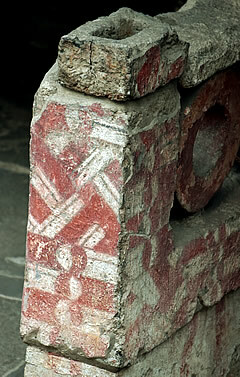 Much of the Templo Mayor site is under cover to protect precious sculpture and paint. 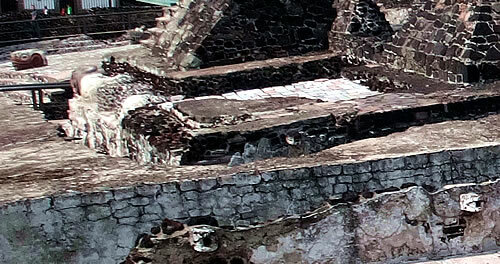 The further green roof covers Templo Mayor, the nearer covers the House of the Eagles. On the left the entrance to House of the Eagles faces west and leads to a columned portico. The portico at the top of the steps was open to the west with a roof supported by square columns. 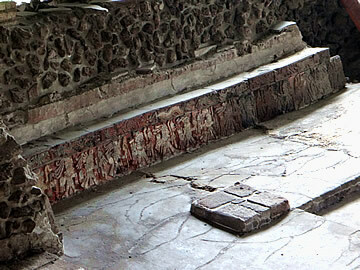 The vertical surfaces beneath the benches which lined the walls were covered with a polychrome carved frieze. The entrance on the left led to a vestibule which in turn led to the main ceremonial room. Trade was the driving force of the Aztec conquests, for precious materials such as jade and obsidian, jaguar skins and cocoa beans, but also to obtain the vast numbers of sacrificial victims to appease the gods. At Templo Mayor these would have their hearts cut out before the bodies were rolled down the temple steps, mimicking the defeat of Coyolxauhqui. North of the dual temple lies one of the most important buildings of the Sacred Precinct - the House of the Eagles. It was here that the elite of the society would perform their private ceremonies. The building dates from between 1430 and 1500, undergoing three expansions during that time. 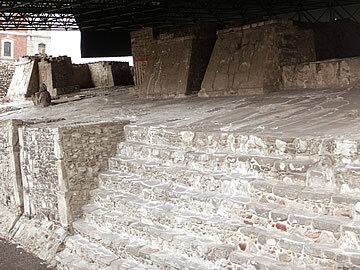 Phase II of the building is the best preserved, built around 1470 in the reign of Axayacatl. 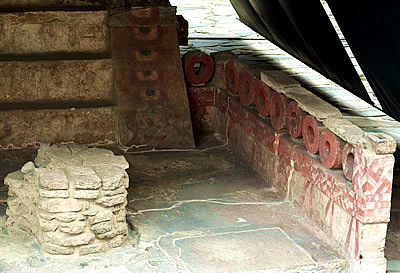 The architecture is influenced by the Toltec style, from centuries past, particularly in the benches which line the walls and are decorated with carved and coloured friezes. Chemical analysis of the plaster surfaces has revealed the presence of burned copal incense, blood, and food offerings of both plant and animal origin. 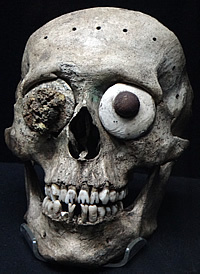 Mictlantecutli, god of death, ruler of the Kingdom of the Underworld, Mictlan. 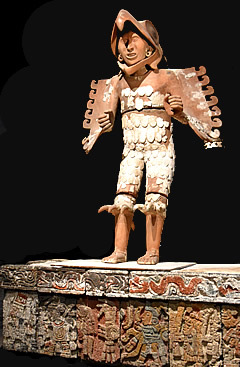 The liver was closely associated with Mictlan, according to Aztec beliefs, which is why, in this statue, it hangs externally. Armed (spears and shields?) warriors on a bench frieze in the portico of the House of the Eagles. 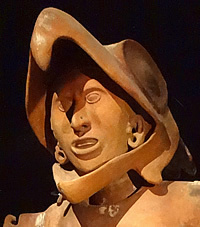 Four magnificent life-size ceramic statues were found during excavations of the house of the Eagles, dating from the reign of Moctezuma I (1440-1469). 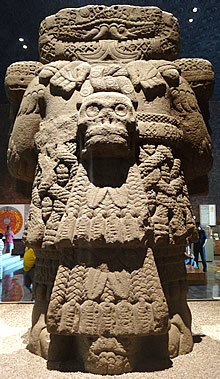 Two are of Mictlantecutli, the god of death - they once flanked the north entrance to the House of the Eagles. The others are of Eagle Warriors which once flanked the main western entrance. Eagle Warriors, along with Jaguar Warriors, were the most important members of the Aztec army, the former governed by the sun, the latter by earth and the night. They dressed in appropriate costumes with masks, pelts and feathers as appropriate. The open portico on the right led via a centrally placed entrance to a vestibule, centre. To get to the main ceremonial room, on the left, celebrants had to turn left then right - this arrangement had the advantage of shielding the ceremonial room from people passing the front of the building. 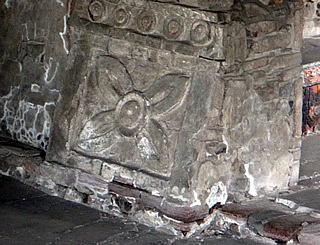 Four-petaled flowers, on either side of entrances to spaces within the ceremonial room, symbolise the four corners of the universe. 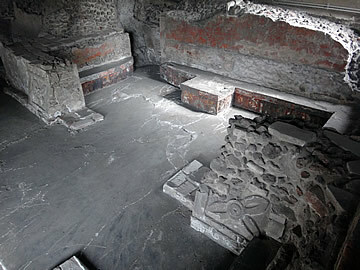 Main ceremonial room, House of the Eagles. 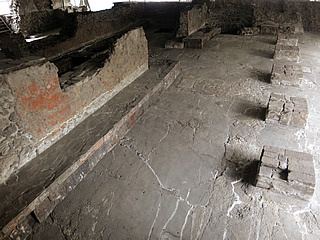 North end of the ceremonial room of the House of the Eagles. Altar and benches with carved polychrome reliefs. Found in the House of the Eagles; tears, symbolic of rain, pour from the eyes. Aztec copy of a Toltec brazier. 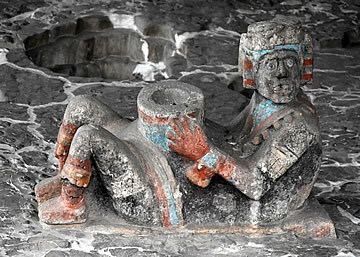 The armed warrior friezes lead to an altar at the north end of the ceremonial room, decorated with a zacatapayolli, a ball of dried moss or grass which held the spikes or spines used in sacrifice or blood-letting rituals. Skull wall in the museum. 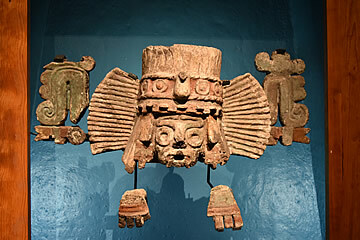 Between the House of the Eagles and the great temple was an impressive skull rack - a tzompantli. 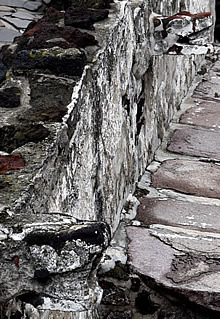 Platform of the Tzompantli which once supported skull racks. 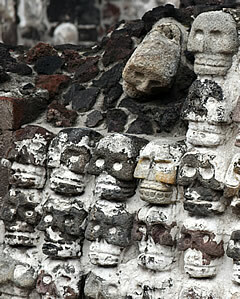 Its platform is well-preserved and consists of walls of carved stone skulls. Originally wooden racks of sacrificial skulls would have been arrayed on top of the platform. 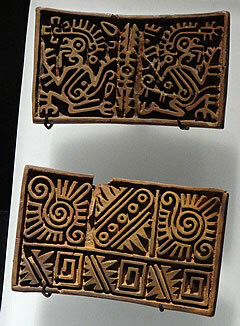 These were made from horizontal wooden poles pushed through the skulls. It was not the only skull rack in the city and thousands of skulls were probably displayed. East of the tzompantli is the North Red Temple built in the talud-tablero style as the Aztecs had observed at Teotehuacan, i.e. a rectangular platform on a slope-sided base. The vestibule has a small round altar and stuccoed walls painted in red and white. At the rear the small temple is covered with designs in red, blue, yellow, black and white. The figure is Xiuhtecuhtli, the fire god and also represents life after death, alongside masks, figurines and decorated skulls. Having thoroughly explored the site we spent a good deal of time in the excellent museum. The artefacts really help to understand the ethos of the various buildings and bring the Sacred Precinct to life. 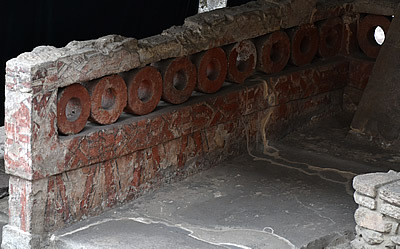 Offerings in partiicular, buried within Templo Mayor either with burials or when a new building phase is begun or completed, allow much to be learnt about the society. 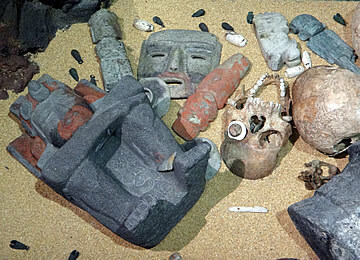 Xiuhtecuhtli, the fire god, alongside braziers, skulls, jade beads and many symbols of the sea including a saw from a saw fish on the right. These architectural elements were once covered with stucco and stood on a Mexica temple roofline. 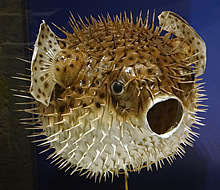 Dyodon hystrix - spotted porcupine fish. The Aztecs believed that the earth was a fantastic beast known as Cipactli, like a crocodile or sawfish, floating on a sea. 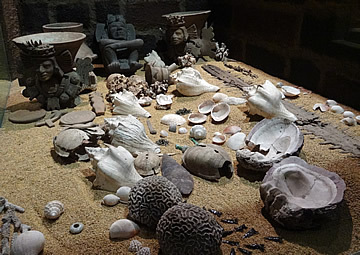 Shells, coral, sea urchins, were used to represent the sea in offerings. The skin of the earth monster was symbolized by unusual creatures, especially if they were spiny, crocodile skins, turtle shells. Also lord of the year and of turquoise. He is represented as a bearded elderly man with a turtle shell on his back. The Aztecs believed that he lived at the centre of the Universe. Ceramic seals used to stamp designs on cloth and paper, sometimes ceramics. From excavations beneath the cathedral. 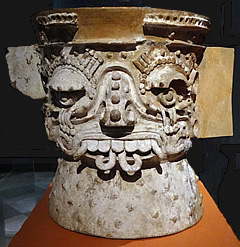 Object shaped like a turtle shell and with a deity head in the Mixtec-Puebla style. This magnificent mask was found in Templo Mayor but originates from much further south.The Olmecs may well have been the first significant culture of mesoamerica, their civilisation is thought to have begun c. 1200B.C. and flourished until c. 400B.C. 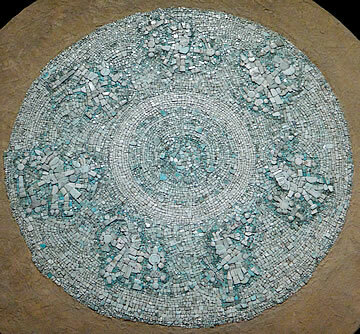 This beautiful mosaic is composed of some 15,000 small turquoise pieces and dates from Stage VI of Templo Mayor between 1486 and 1502 (it was found outside the Sacred Precinct). 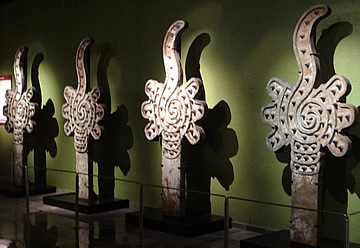 Around the perimeter are arranged seven figures dressed as warriors and related to two deities: Tlahuizcalpantecuhtli(Lord of the Place of Twilight) associated with Venus, and Mixcoatl (Cloud Serpent) associated with the Milky Way. 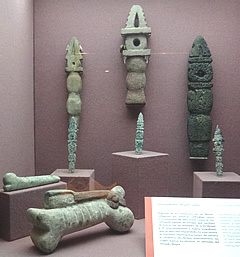 Different styles of items found in offerings, as well as the presence of objects such as shells, and material such as jade, which could not be found close by, are another indication of how far the Aztec empire stretched. 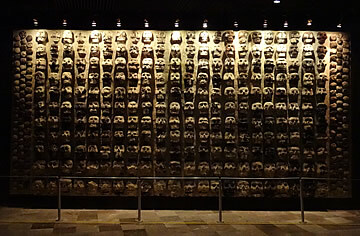 A few of many masks on display in the Museo Templo Mayor. Representation of how the Sun Stone would have looked. One of the most important and impressive Aztec artefacts ever discovered is this 3.58m diameter stone, discovered face down - hence the good preservation - in front of Templo Mayor in 1790. It weighs 25 tons and was once part of Templo Mayor, thought to have been intended as a gladiatorial sacrificial altar, known as a temalacatl. However, it was not finished because of a large crack on the back of the piece, though it is thought still to have been used to stage fights between warriors. 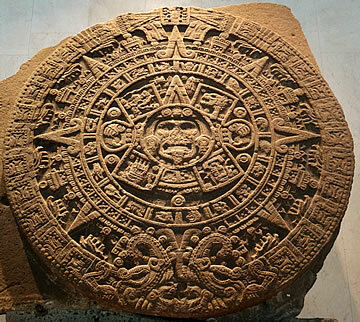 At first the stone was at first wrongly identified as an Aztec calendar, because it has symbols representing days and suns. 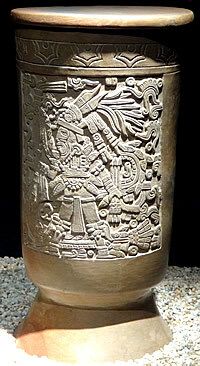 To explain the iconography of the stone it is important to understand something of the creation stories of the Aztecs. They believed that current creation had been preceded by four previous creations, also called suns. In the first creation man was made from stone, in the second from wood, in the third from clay/dust and in the fourth from jade. Each time the gods returned after 4000 years to see how man was doing and if he was grateful to the gods. Each time the gods found man simply surviving and procreating without progressing. Each time a different god destroyed creation: the jaguar god, wind god, fire god and water god who sent floods. A section of the sun stone showing two of the four previous suns and some of the twenty day glyphs. On the fifth attempt the gods decided that man needed something from the gods themselves, so one of them must sacrifice himself in fire to give blood. A young, robust god stepped up but became frightened and hesitated. A less prestigious god then volunteered and jumped straight into the fire. The first god was then ashamed and also jumped in. Blood was collected and two suns created. This time man was more successful at progress and worshipping the gods (who returned this time after 52 years) with song and dance and emulating the gods' actions with blood sacrifices. 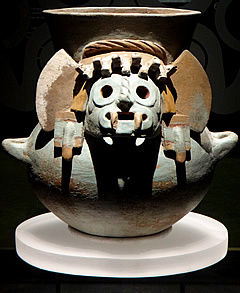 The face of Xiuhtecuhtli, the fire god, emerges from the centre of the disc, his tongue in the shape of a tecpatl, a ceremonial knife, and he holds bleeding hearts in each of two claws. He is surrounded by the four previous suns (the square glyphs). 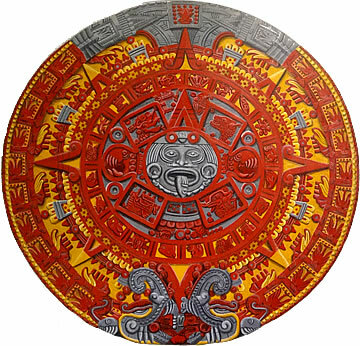 The Aztecs used a dual calendar: one of 13 times 20 day cycles making a 260 day period, the second a 365 day agricultural calendar. A complete cycle is only completed every 52 years. Surrounding Xiuhtecuhtli and the four suns is a circle of the twenty glyphs representing each of the twenty days in the 260 day period. Around the edge of the stone are 360 spots representing 360 days of the 365 day cycle, the extra five days are represented in dots between the four suns - these final five days of the year were dedicated to the sun. 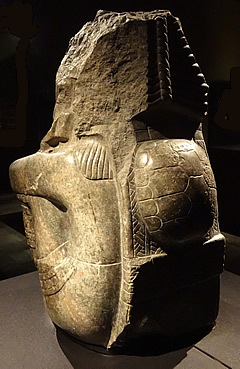 The stone is now a star exhibit in the impressive Anthropology Museum in Mexico City. Mexico: From the Olmecs to the Aztecs, Michael D. Coe & Rex Koontz, Seventh Edition, Thames & Hudson, 2013.